Artichoke has always been a place that I’ve wanted to try since I had a phase where I was quite into Moroccan/Middle Eastern food. Amusingly, I went for the brunch first instead of their dinner because I happened to be nearby on a weekend. Their brunch menu is quite different from their dinner menu, being small and mostly different from dinner. Most brunch places have a scrambled eggs dish and Artichoke is no exception. It comes with several choices of sides, and one popular one is the sweet glazed bacon chop. While the scrambled eggs was done decently, I really didn’t like the bacon chop because the one-dimensional sweetness didn’t fit into the rest of the dish and it was boring to eat a large crunchy piece of fat. The other popular dish is their lamb shakshouka. Now this dish I really liked, very rich and full of flavours. There’s a great mix of different tastes here, from the sweet tomatoes, savoury roast lamb cubes and the sourish labneh. This is the one dish that I’ll keep coming back to brunch at Artichoke for! 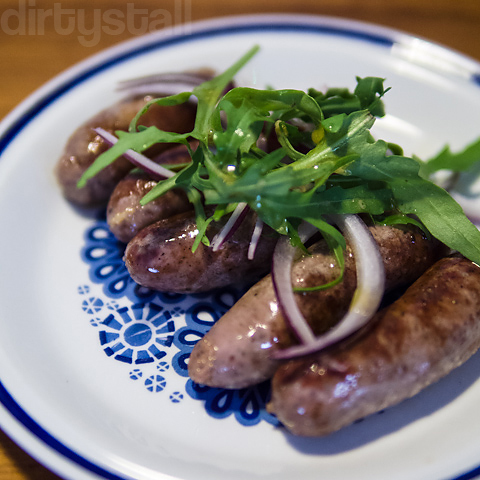 Spicy Turkish sujuk sausages – didn’t like the taste of these sausages. In fact I don’t even remember what they tasted like but I do remember I didn’t like the taste. All in all, I think the only time I’d return to Artichoke is when I’m craving their lamb shakshouka, otherwise I don’t see the rest of their menu as any draw for me. Their dinner menu is a different (and better) story however, and I’ll blog about it…someday. 4 Responses to "Artichoke Brunch"
Hi I was introduced to your blog by thesilverchef. Please do leave the address of the place you pratronised. Thanks for your comment, I’ve added in the address. hahaha gotta love the last line! btw, i discovered many hidden treasures in the grocery stores of montreal’s little italy. and they’re not as horrendously overpriced as in sg! Hahaha well I do hope to get it out within the next few months at least! Bring back some guanciale! !